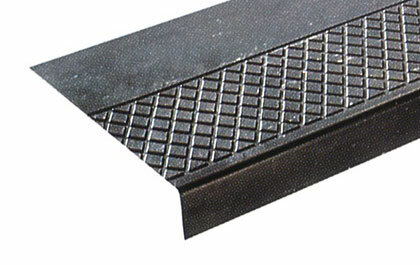 Our medium gauge Diamond Pattern Rubber Stair Tread with extra long nosing for pan-filled or molded concrete steps. Not only will this 2" depth completely cover pan-filled step nosing, it adjusts from 90° to 60°, to accommodate stairways with return angle nosing. Makes stairways safer for visually impaired and handicapped. Fine for all but heaviest traveled stairways. Meets Federal Specs: RR-T-650E and ZZ-T-001237 (GSA-FSS). Furnish and install No. 626 Diamond Design Stair Treads from Discount Floor Mat Store; 3/16" thick, tapering to back edge, 12-1/4" deep. Treads shall have a 2"adjustable square nose; a Flame Spread Rating of 75 or less using ASTM-E-84 Test; a sanded back to assure proper adhesion; contain no asbestos fiber; molded of top quality homogeneous rubber compound, color extending throughout thickness; free from objectionable odors, blisters, cracks or imperfections which might impair serviceability. Select standard length of 36", 42", 48", 54", 60", or 72"; Select standard color from Color Series I and Color Series II. The #626 rubber stair treads are available in only square nose. 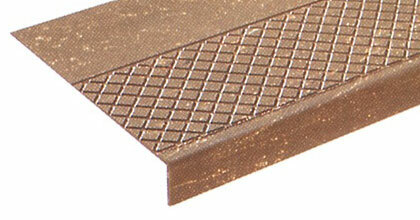 For round nose rubber stair treads, please see our #622 Diamond Pattern Rubber Stair Tread. Minimum quantities apply for select colors. See color chart for details. Extra long nose rubber stair treads are available in Colors I, II. Two long wearing abrasive mineral coated Grit-Strips are recessed the full length of the stair tread at the impact area to help prevent slipping. Design surface with Grit-Strips offer added safety and longer wear. All stair treads have color through entire thickness. All treads meet Flame Spread Rating of 75 or less using ASTM-E-84 Test. We also offer a variation of Grit Strip Inserts for the Visually Impaired below. 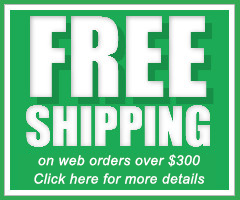 Orders under $100 material cost will be charged a $15 handling fee. An abrasive mineral coated Grit-Strip is recessed the full length of the stair tread at impact area to help prevent slipping. This anti-slip strip meets specifications for the contrasting color to alert Visually Impaired people. Design surface with Grit-Strips offers added safety and longer wear. All stair treads have color through entire thickness. The treads meet Flame Spread Rating of 75 or less using ASTM-E-84 Test. Extra long nose stair treads are available in Colors I, II.